It was Labor Day weekend 2003, and there was a strange boy in our apartment. My roommates and I were throwing a party that night in honor of one of our 21st birthdays, and when we came out of our respective bedrooms to prepare, we found someone we'd never met before standing in our kitchen, chopping limes. "Hiiiiii" squealed the birthday girl, spotting him as she bounded down the stairs. It turned out that they'd met the day before, he was Brazilian, and he'd come over to make her a birthday caipirinha. Before long, we were all in the kitchen, muddling mint, crushing ice, and sipping the sweet and sour beverages. Needless to say, it was a night to remember. And ever since then, I've always though of caipirinhas as a celebratory cocktail. This strawberry version (which is technically a caipiroska because it replaces cachaca--the sugarcane liqueur usually found in caipirinhas--with vodka) is the quintessential summer party drink. It's not the kind of drink you'd crack open after finishing the laundry, or finally unpacking your last box (I went with wine for that one), or just because it's Tuesday. No, this is decidedly a drink for those special kind of summer celebrations. It's for picnics in the park and sand between your toes. For barbecued chicken and watermelon juice running down your chin. For boat rides and for birthday parties--both 21st and (well) beyond. So get your summer off on the right foot and find something to celebrate. Do it soon. Place the strawberries in a cocktail shaker. Add the mint, lime and sugar, and muddle with a wooden spoon until the strawberries are almost pureed. Add the ice and vodka and shake well. 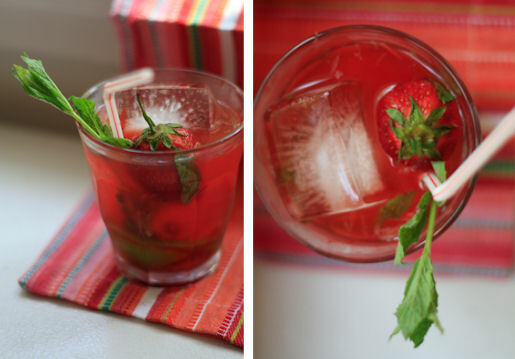 Divide between two glasses, garnish with more strawberries, lime and mint if desired, and serve.